We first tried this dip over the holidays and really liked the flavor, and I now keep a jar of roasted red peppers on hand specifically to make this dip on short notice, but it’s also delicious with home roasted red peppers. 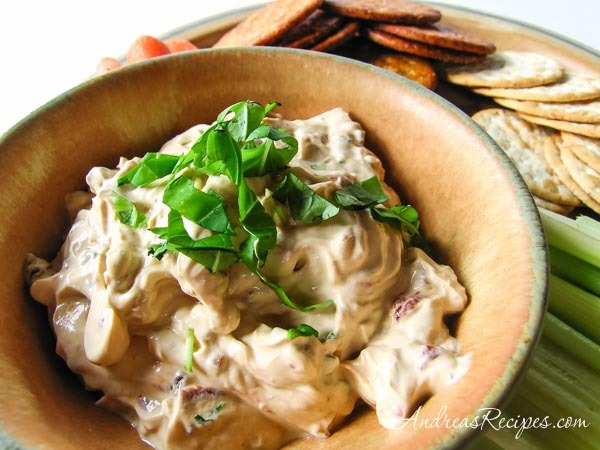 It’s a good dip for parties, Bunco, or brunch and it pairs well with crackers or crudités. The base is sour cream, but the flavor comes from the garlic, peppers, and the balsamic vinegar reduction. In fifteen minutes you can have this prepared and then toss it into the refrigerator to let the flavors marry. It’s a good make-ahead dip because the flavor gets better as it sits, just give it a good stir before serving. You can use dried basil if you can’t find any fresh, just toss it in with the peppers and oil while cooking, but I prefer the flavor of the fresh basil. In the skillet, heat the oil over medium heat and add the garlic, stirring for about 30 seconds. Add the chopped peppers and cook for about 1 minute, then add the balsamic vinegar and cook over moderately low heat, stirring, until dry, about 12 minutes. Transfer to a bowl to cool. Stir in the sour cream and basil and season with salt and pepper. Cover and refrigerate until chilled. Instead of using jarred peppers, you can roast your own. Roast the peppers over a gas flame or under the broiler until charred all over. Put them in a plastic bag and let steam for 20 minutes. Remove the skins, cores, and seeds. Pat the peppers dry and chop. To use dried basil, cook it with the peppers and vinegar. Looks delicious. I was actually looking at dip recipes the other day and thinking to myself that I wanted something a little different than my usual choices. I will try this out this week…thank you! I enjoy your site every time I get a chance to take a peek. I share your love of cooking and as silly as it sounds, I love the pictures you take of your food! I’m also a stay at home mom (girl almost 3 and boy almost 1) so I also enjoy the short stories about your home and family. Thanks Tina, I hope you enjoy it! Thanks for visiting, Gail! I’m glad you enjoy the site.